The Little Backyard Farm: I finished on time! I am so excited! I got to knit again! It was a little speed-knitting but I just enjoyed it so much. My friend Anne's baby girl had a one year birthday and I wanted to give her something thoughtful. I know how much Anne likes hand made hats so I knitted her one. I thought of it only 3 days prior to the party and so I had to do it quickly. But I finished. 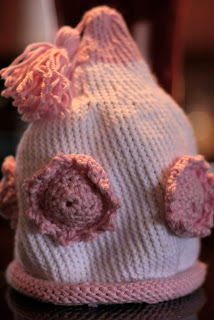 And now I am thinking about my Etsy.com store... Should I include knitted hats? What do you think? just wanted to say hi and introduce myself!